I’ve recently delivered another 600 books to three schools and a youth project in Jamaica. They are: Nannyville Basic School and the Nannyville Youth Uprising Club, both in Kingston; and The St James Day Care & Learning Centre and New Garden Primary and Infant School, both in Mount James, St Andrew. The books included basic readers, children’s storybooks, general information and reference books including dictionaries, black history books, poetry and fiction. There were also a number of big illustrated board-backed books for the younger children who are just starting to read. Derek and I picked up the books from Kingston Wharves, helped by our friends Ivan Coore and George O’Connor who provided transport and helped us to deliver the books to the schools. First, we made a delivery of 200 books to Nannyville Basic School in Kingston. Nannyville is a deprived community in east Kingston, and although the school is spacious and well-built, it is chronically short of resources. 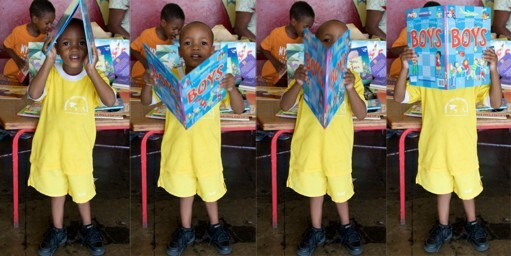 As the boxes of books were opened groups of excited children rushed to come and examine them, as did the parents and teachers, as you can see in the pictures. Ivan Coore also received books for the Nannyville Youth Uprising Club, situated opposite the school, where he helps run activities and training courses for teenagers from the area. Then, from the heat and dust of Kingston, we drove far up into the Blue Mountains to the Mount James School. Both the Mount James and New Garden schools are set in the most beautiful and lush countryside, with the majestic Blue Mountain peaks ranged against the skyline. By this time, in the late afternoon, the schools were closed for the day, but Mrs. Violet Nelson – known to everyone as Miss Pansy – the Vice Chairperson of the St James Day Care & Learning Centre was there to receive the books on behalf of both schools. Miss Pansy was the lady I mentioned in an earlier blog, whom I met last year when I was in Mt James when she told me of the great need for books in this deprived rural area. She was extremely delighted, and she said: “We are so happy that you have come with this wonderful gift for us. The teachers and children thank you so much, and please thank everyone who donated, on our behalf.” She couldn’t stop smiling, as you can see from the photo. That’s the good news: now for the not-so-good news. I feel bound to mention the four days of stress and frustration I endured at the Jamaica Customs in Kingston before I was able to collect the books. For those who have never visited the Jamaica Customs in Kingston, I can tell you that it is a very alienating place. When you go to collect your goods, after first having visited the shipping company who transported the goods, where I collected the necessary documents to be handed to customs, I proceeded to Kingston Wharves. There you have to go through a maze of different departments on the compound, entering each one through security barriers designed like turnstiles at football grounds only much more intimidating. At each stage you have to produce a raft of IDs – passport, Jamaica tax registration number, and, of course, the bill of laden for your goods. These are examined in minute detail at every turnstile before – if you are lucky – an unsmiling official presses a button to let you in. So you go first to the Manifest Department, and here you pay for the daily handling and storage of your goods since they were landed. Then you progress to the Personal Effects Department where you pay duties for any Amendments to Documents. Eventually you reach the ‘Berths’, the collection department. At each stage you have to join a queue for anything up to two hours – and all of this in suffocating heat. I spent my first day, approximately six hours, going through these various departments, where they confirmed and stamped my documents, before I got to the collection department to pick up the books. Here I was informed that Customs needed a ‘waiver letter’ from the Ministry of Education before the books could be released duty free. Even though the boxes had been opened and it was obvious that they were books, and one official even said to me what good work I was doing and how badly schools needed these kinds of books, nothing could be done without a ‘waiver letter’ if I was to avoid import charges. I immediately contacted the Ministry of Education and Mrs. Analia Wallace-Muir in the Office of the Permanent Secretary – who I had corresponded with prior to going to Jamaica – and she kindly advised that she would try to expedite the preparation of a ‘waiver letter’. We waited the following day for a phone call from the Ministry to collect the letter, but unfortunately the Minister was busy attending meetings on that day, so the letter was not ready for collection until the following day. So the next day found Derek and myself driving through the early morning rush-hour traffic to the Education Ministry, where I collected the letter, which was written and signed by the Minister for Procurement. Thinking that we now had everything required to get the books, we set off for Customs. There, after going through the turnstile ritual, I was directed to see a Customs Supervisor who informed me that this ‘hand delivered letter’ was not acceptable and I could not have the books. He said Customs needed to have the letter mailed to them directly from the Ministry. In desperation I turned again to Mrs Wallace-Muir at the Ministry of Education, who was extremely helpful and supportive. I phoned her from the office of the Customs Supervisor, told her what was happening and asked the Customs supervisor to speak to her. She confirmed that the letter was genuine and that it had been written and signed that very morning. The supervisor decided, however, that this information was not sufficient for him to authorise release of the books and he asked her to ensure that an email of the letter, which had been given to me, was sent directly to the Jamaica Customs. This process took up most of the day while I sat around waiting on the wharf. Finally, in the late afternoon, just before closing time, I was informed that as long as I paid for the additional three days storage and handling this process had entailed, the books would be released. Derek and I were so hot, tired and depressed – and besides it was far too late to deliver the books – that we decided it would be better to go back to Kingston Wharves the following morning. This level of needless, obstructive bureaucracy is overwhelming, unnecessary and totally counter-productive. There are many well-documented cases where individuals and friends of Jamaica have experienced these difficulties getting their gifts delivered to the intended beneficiaries. 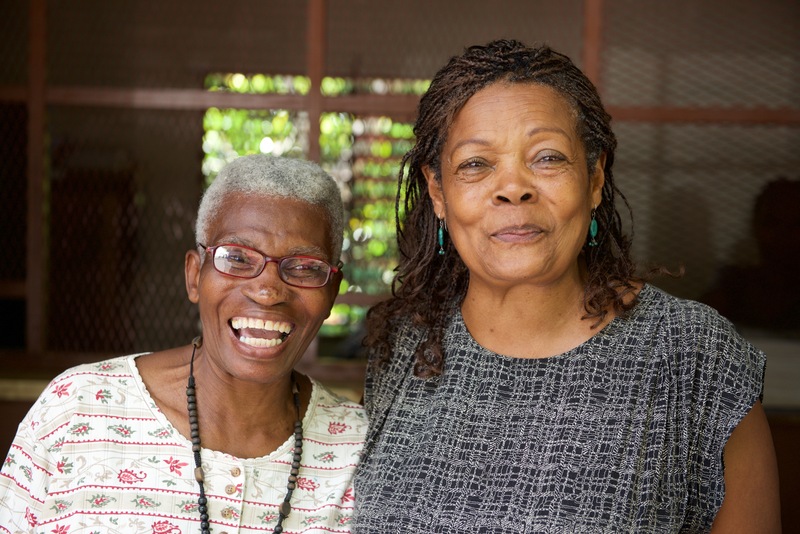 Why does Jamaica, which needs all the help and goodwill it can get, make life so difficult? However, I want to end on a positive note. 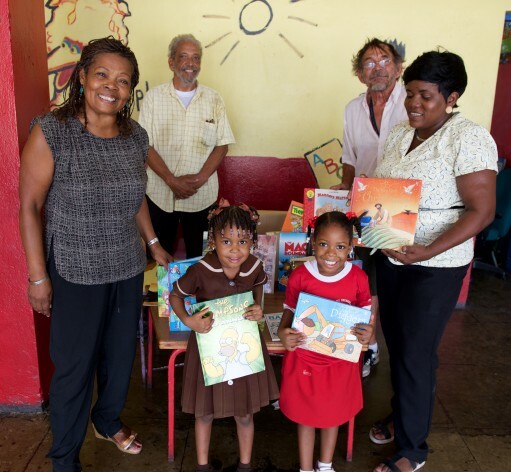 My very sincere thanks to Mrs Wallace-Muir at the Education Ministry for her persistence and support, to Ivan Coore for helping with transport in Kingston, and to Beverley Johnson of JLB Shipping who again generously organised transport of the books to Jamaica. And last, but not least, a massive thank you to the donors – Mrs Dawn Powell, who came all the way from London bringing boxes of children’s books, some brand new, and delivered them to my door; Elenor Carroll from Birmingham Libraries who continues to support this project; Corale Chapman, presenter at New Style Radio Birmingham for the many bags of books from listeners; and long-time friend Sheryl Thomas who brought her books all the way from Bath and delivered them to me.